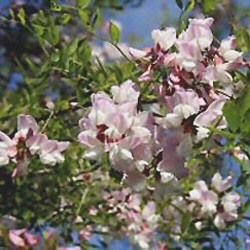 A relatively rare tree, compared to the false acacia or black locust tree (Robinia pseudoacacia 'Frisia'), the pink acacia tee (Robinia x margareta 'Pink Cascade') is noted for its very numerous and beautiful rich pink coloured flowers, which arrive during June and its dark, pinnate leaves are especially appealing. 10-15 Litre Pot: 180-240cm, 2-3 years old. We give a range of pot sizes because it depends on which wholesaler we can leverage/barter/blackmail a better deal from that dictates which pots we use. The height range is to cover us for a years growth so depending when in the season you buy them determines which end of the height range you are at. The larger and more vigorous Pink Acacia trees are graded out and planted into larger pots. This is no guarantee that the tree will continue to be more vigorous than the Pink Cascade sat in the next isle over feeling inadequate for itself. You can plant potted Pink Acacia all year round except for when the ground is frozen. Planting at the end of Summer when the soil promotes root growth and earlier establishment so if you are going to pick a time to plant, then that is a good one. Somewhat slow-growing, expect this tree to attain a height of up to 4m (13ft) after 10 years.